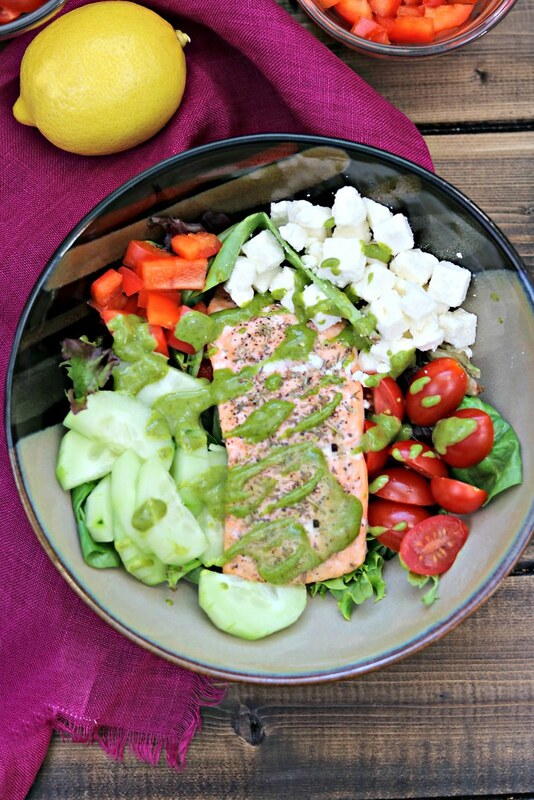 Grilled salmon, combined with crisp vegetables and a tangy lemon basil vinaigrette is bursting with flavor, and makes this Salmon Greek Salad one you don’t want to pass up! I love entree salads, don’t you? Especially when they have salmon. And lemon basil vinaigrette. I mean, as much as I love salads, in this instance I was most excited for it as a vehicle to shovel the vinaigrette into my mouth. Sort of like corn dogs and mustard. But that’s another story. But seriously. this salad. 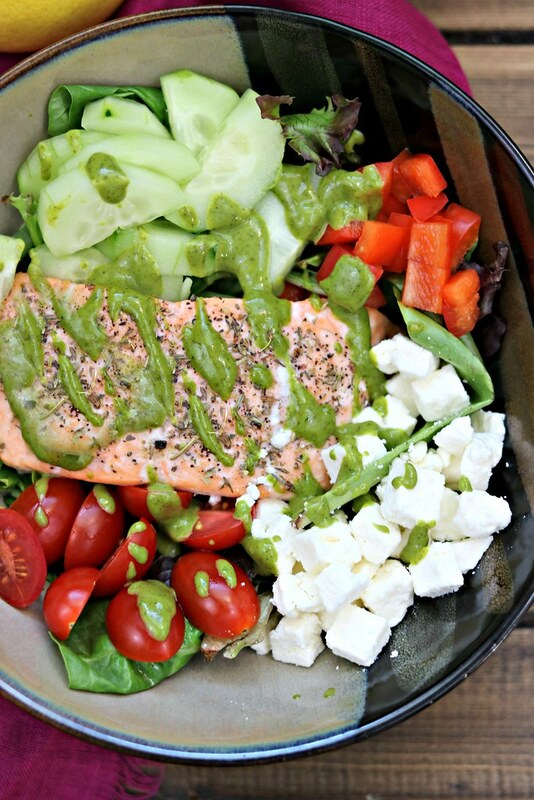 Perfectly grilled salmon, on top of crisp greens, with cucumbers, tomatoes, red bell peppers, and creamy feta crumbles. Then drizzled (doused) with deliciously tangy lemon basil vinaigrette. Please tell me what could EVER be better than that?? It’s a pretty sure thing that if lemon is involved, I’m totally there. Good thing my toddler loves it, too. And J tolerates my obsession with all things lemon. Because really, what choice does he have? It’s part of the package. Me and Lemons. Lemon love for life, y’all. 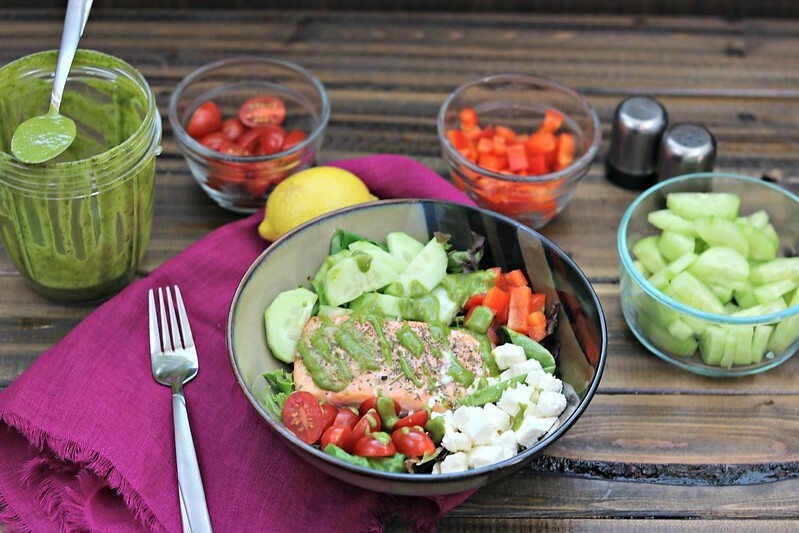 This salad is perfectly refreshing, delicious, and healthy! What more could you want?? While this is a perfect summer salad, it can be enjoyed year-round. Even in the current rainy and cooler temps that we (in Central Texas) are experiencing. And by cooler temps, I mean 80’s. While I know tons of people – especially people in Texas – are ready for fall and winter temps to get here so they can escape the heat, all I’m really worried about escaping is the mosquitoes. For the love of all that is holy, those little devils eat me alive every year. Go outside for 5 minutes, come back in with 5 mosquito bites. So, for that reason alone, I look forward to colder temps. Well, that and boots and sweaters. But being cold is not my thang. What are you most looking forward to as summer fades out? All things pumpkin? Leaves changing colors (if that happens where you live)? Snow (again, if that happens where you live)? Halloween/Thanksgiving/Christmas?? Besides the temporary absence of mosquitoes, I look forward to baking and the holidays. Especially Christmas. It’s my fav. Though I’m not sure how much decorating I can do this year with a very hands-on toddler. I don’t see the tree faring well against her little grabby hands. I’ll think of something though. We have to have the tree up! And, since we are still months away from all that jazz, let’s just focus on this delicious salad. At least until next week when #PumpkinWeek begins. 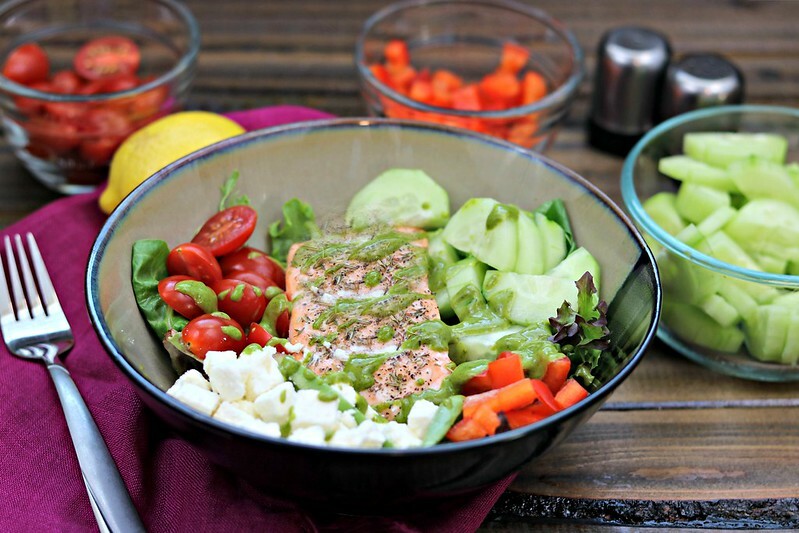 Grilled salmon, combined with crisp vegetables and a tangy lemon basil vinaigrette is bursting with flavor, and makes this Salmon Greek Salad one you don't want to pass up! Heat olive oil in a grill pan or skillet over medium-high heat. Once hot, add the salmon, skin-side down, and sear for 2-3 minutes. Gently flip, and sear the other side for 2-3 minutes. During this time, use tongs to gently remove the skin. Flip one more time and cook an additional 2-3 minutes, or until cooked to your desired liking. Meanwhile, to make the lemon basil vinaigrette, combine lemon juice, zest, olive oil, mustard, honey, garlic, basil, oregano, salt, and pepper in a blender, and blend on high until well-combined. Dressing will be a little thick and opaque in color. Taste and add more salt and pepper, if desired. To assemble the salad, divide the salad mix among 4 bowls. Top with a salmon fillet, and 1/4 of the tomatoes, cucumber, red bell pepper, and feta. Top with desired amount of dressing (I say the more, the better!) and devour!